Senator Bob Duff represents the 25th Senatorial District, which includes Norwalk and Darien. Re-elected to the State Senate in 2018, he was chosen by his Senate colleagues in 2015, 2017 and 2019 to serve as Senate Majority Leader. Bob’s Norwalk family ties go back five generations. His passion for public service began at the age of eight. That’s when Bob voiced his concerns for the future of Duffy Field to then-mayor William Collins. Today, we still have Duffy Field — now renamed Veterans Park. Since joining the legislature, Bob has been a tireless advocate for job creation in Connecticut. He played a leading role in championing landmark jobs legislation. As part of this legislation, later expanded, Connecticut created the Small Business Express Program which provides loans and grants to small business to spur business growth and promote new jobs. Bob has earned a reputation as a consumer watchdog. 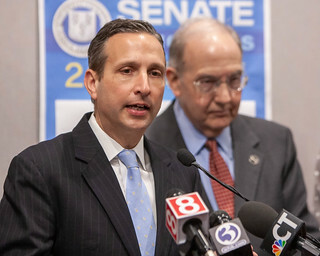 As Chair of the legislature’s Banking Committee, Bob worked to safeguard Connecticut homeowners from the ravages of predatory lending by creating a package of first-in-the-nation reforms to reduce the number of home foreclosures in the state. Bob’s consumer advocacy continued as he went on to Chair the Energy and Technology Committee. As Chair, Bob championed two pieces of major energy legislation which taken together implement a new comprehensive energy strategy for Connecticut, restructuring support for renewable sources of electricity to provide for cheaper, cleaner and more reliable energy for consumers and businesses. Under Bob’s tenure as Majority Leader, the Senate Democratic caucus has achieved numerous legislative victories. Most recently, the Senate Democratic caucus passed legislation standing up for DREAMers, the National Popular Vote, net neutrality, data privacy, health care access, gun safety, LGBTQ rights and equal pay for equal work. Bob has long been fierce in promoting the needs of his district by securing funding to assist in the rebuilding of Norwalk’s downtown, supporting school upgrades, creating & rehabilitating affordable housing and passionately supporting arts organizations, like the Wall Street Theater, the Lockwood-Mathews Mansion Museum and the Music Theatre of Connecticut to name a few. Throughout his legislative career, Bob has been honored by The Workplace Inc., AARP of Connecticut, the Lockwood-Matthews Mansion Museum, the Save Cranbury Association, Side-by-Side Charter School, the American Heart Association, the American Lung Association, Greater Stamford Hispanic Chamber of Commerce, Women’s Business Development Council, the Maritime Aquarium, the Norwalk NAACP and the Norwalk Marching Bears, Inc.
After graduating Norwalk Public Schools, Bob earned his bachelor’s degree in political science from Lynchburg College in Virginia. There, Bob honed his political skills as a student senator, campus leader and intern for U.S. Senator Christopher Dodd (D-CT). In May 2010, Bob returned to Lynchburg College to deliver the commencement address to the graduating class and was awarded the degree of Doctorate of Humane Letters. Bob has been a real estate professional with William Pitt Sotheby’s International Realty for over twenty years. Prior to his election to the Senate, Bob represented Norwalk’s 137th Assembly District for three years. Bob, his wife, Tracey, and their two children live on Toilsome Avenue in Norwalk with their rescue dog, Molly.